Indian summer is a period of unseasonably warm, dry weather that sometimes occurs in autumn in the Northern Hemisphere. So….did I hear someone say “Indian Summer”? Because that is what we’ve got going on around here! Good grief! Here it is November and tomorrow it is supposed to hit 80°F! Let me tell you it is super bizarre seeing folks running around in shorts with all that lovely Fall foliage as their backdrop. And although most people seemed thrilled with the weather, it kind of makes me a bit uneasy. I’m afraid it portends no Fall whatsoever. One day it will be 80° F and with little notice at all, besides my head exploding as it usually does with big swings in temperature, the mercury will crash down to freezing. I hope I’m wrong. I love autumn and would like to get in a few brisk jacket days and bonfires before I’m buried in layers of wool! 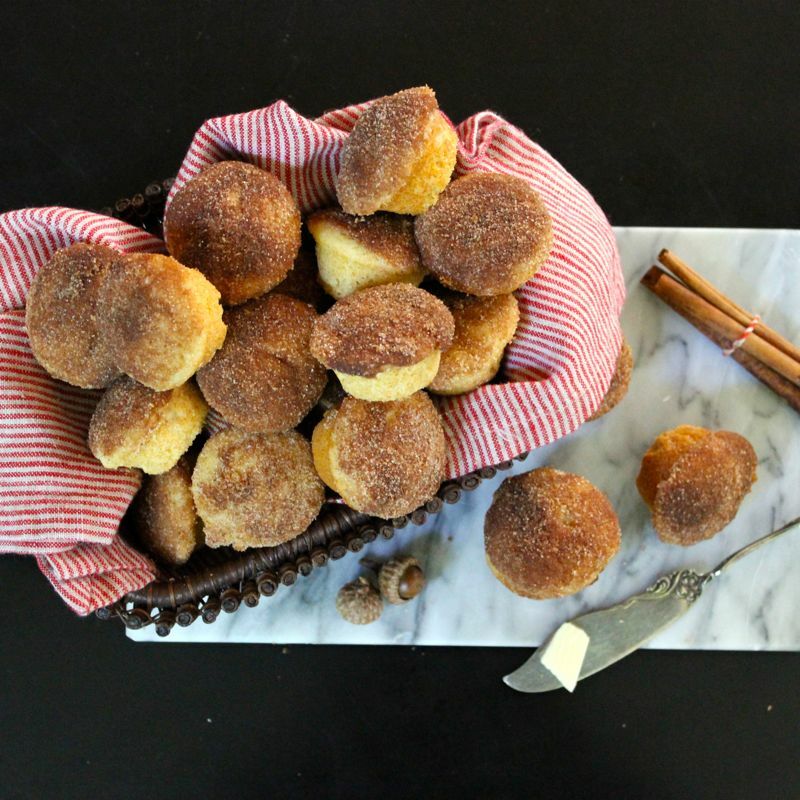 Luckily these Cinnamon Buttermilk Mini Muffins are great no matter what the temp, though the cinnamon and nutmeg flavors do give them a very Fall-type vibe. Though I must confess, no matter what the season, I just can’t get enough of them. 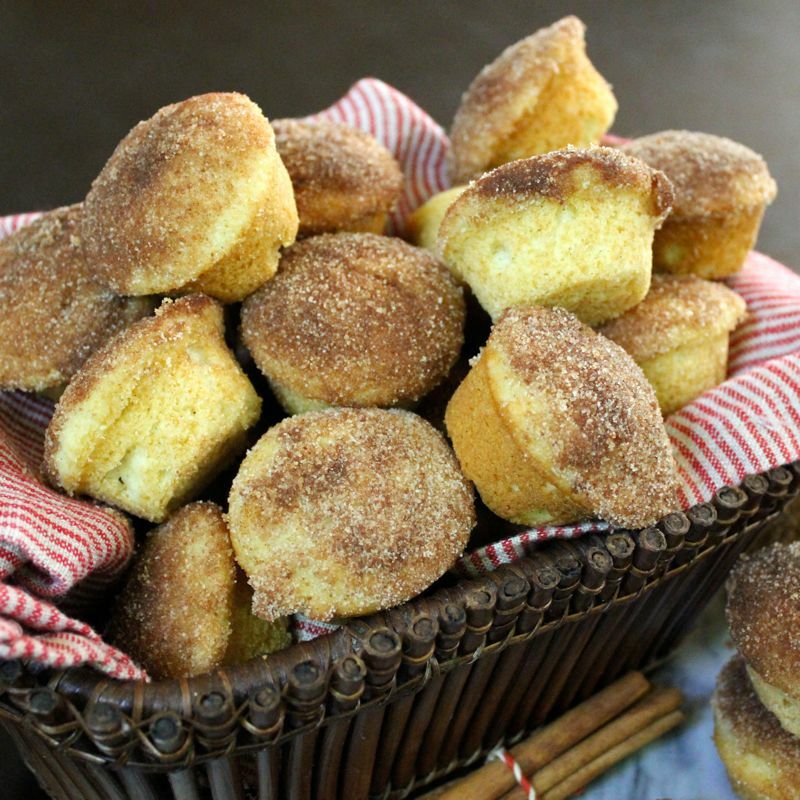 These little muffins are kind of like a cross between a doughnut and a muffin. 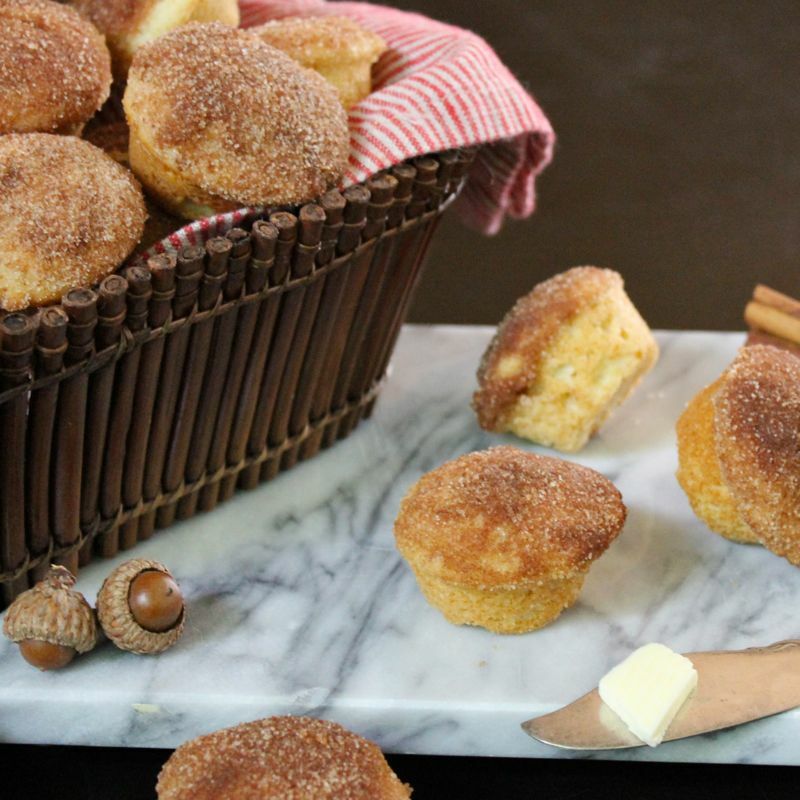 The batter is actually a doughnut batter, but then these muffins are baked, not fried. The buttermilk makes them oh so moist and tender. And the cinnamon/sugar coating is not only delicious and crunchy but also adds to the doughnut-ness of this treat. 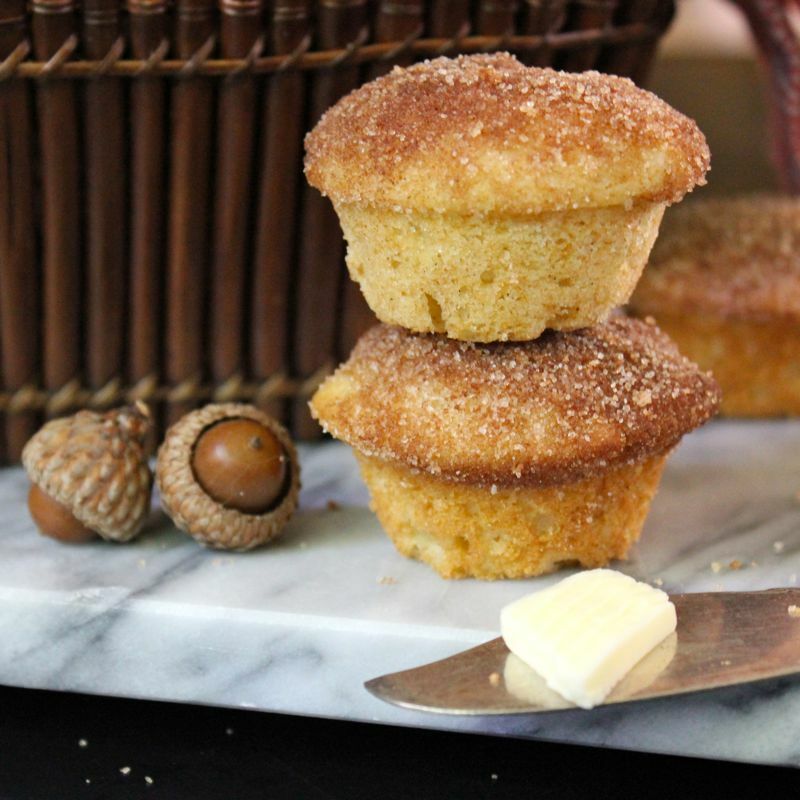 Now you can make these muffins full-sized, but I love to bake them in a mini muffin pan. The mini muffins are just the right size to pop straight into your mouth. You know, like a doughnut hole. And being so pint-sized, you won’t feel as guilty when you have more than one….Oh and believe me you will! Preheat an oven to 350°F. Grease a mini muffin or standard muffin tin with butter or butter-flavored nonstick cooking spray; fill any unused cups one-third full with water to prevent warping. Spoon the batter into the prepared muffin cups, filling each three-fourths full. Bake until the muffins are golden, dry and springy to the touch and a toothpick inserted into the center of a muffin comes out clean, 20 to 25 minutes. Transfer the pan to a wire rack and let cool for 5 minutes. Unmold the muffins and let stand until cool enough to handle. To make the topping, in a small, shallow bowl, stir together the sugar and cinnamon. Put the melted butter in another small bowl. Holding the bottom of a muffin, dip the top into the melted butter, turning to coat it evenly. Immediately dip the top in the cinnamon-sugar mixture, coating it evenly, then tap it to remove excess sugar. Transfer the muffin, right side up, to the rack. Repeat with the remaining muffins. Let cool completely before serving. You are currently browsing the Lea & Jay blog archives for November, 2015.